Scam emails promising the recipient a gift card (or the chance to win a gift card) seem to be the in vogue modus operandi of criminals this festive season. This morning we’ve pulled two new scam emails offering a gift card if the recipient clicks on a link and fills out a few details about themselves. These details are the recipient’s personally identifiable information and financial information. The first email (as shown in Figure A) is a JB Hi-Fi lookalike email where the recipient is told they can “Claim your potential $500 JB Hi-Fi Gift Card”. This particular email was personally addressed to the recipient; we have blacked out the sections addressing the recipient, and have blacked out the email address of the recipient. In terms of phishing, this effort represents a moderate level of complexity. The obvious giveaway is that none of the provided links go back to JB Hi-Fi. Checking on the links this morning they lead to a phishing site. The name of the company is also given as “JB-HiFi” when in fact the official company name is “JB Hi-Fi”, noting the correct location of the dash. 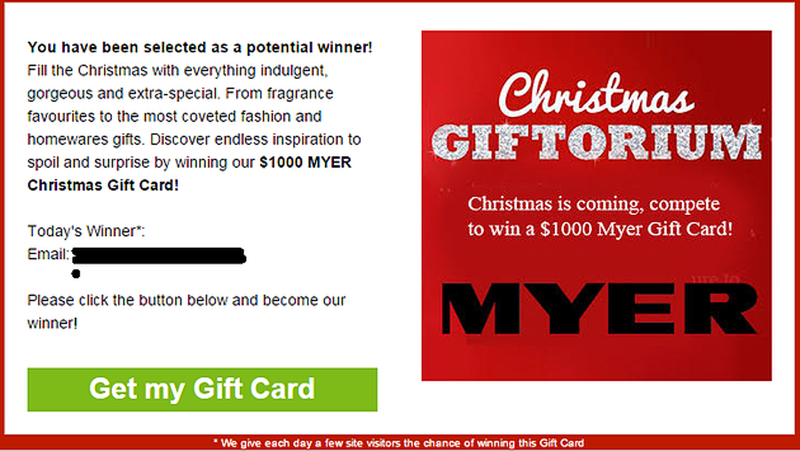 The second email (shown in Figure B) is offering a Myer Gift Card; all the recipient has to do is click on a link, answer a few questions and they will be entered in the draw to win the voucher. As phishing emails go, this one is moderately complex. 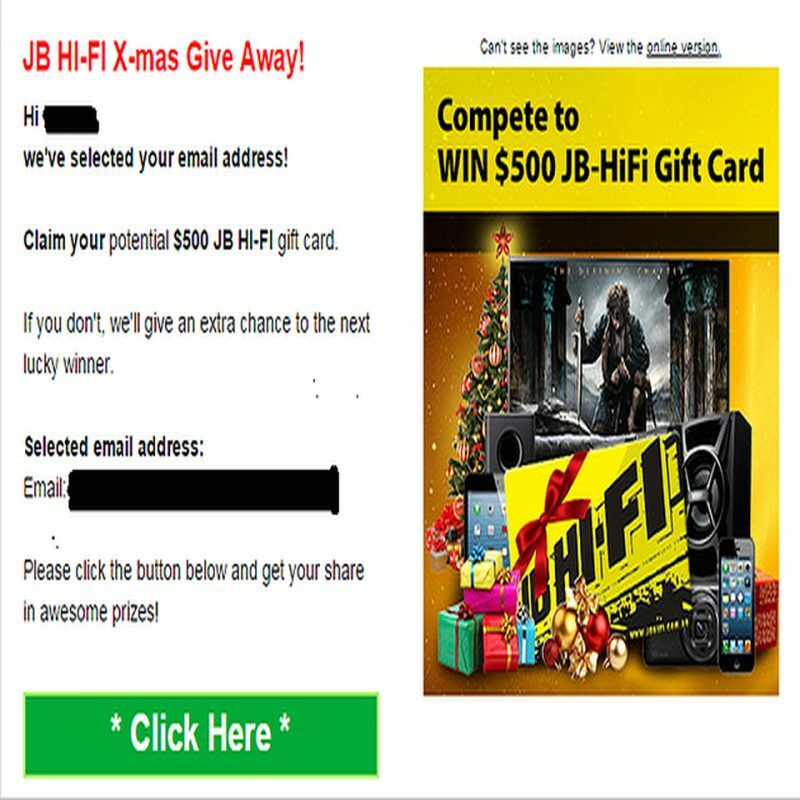 It has some of the hallmarks of the previously mentioned JB Hi-Fi phishing email, including how the recipient could “potentially” win a Myer gift card. Once again, however, the links in the email do not lead back to Myer. Once again they lead to a phishing site. There has been a flood of these types of emails over the last two weeks. Take care if you do receive emails; mouse over the links to check they are valid. Check on the retailer’s web site to see what promotions they are currently running. Don’t download any software contained in an email; several ransomware attacks have been spread via email attachments.